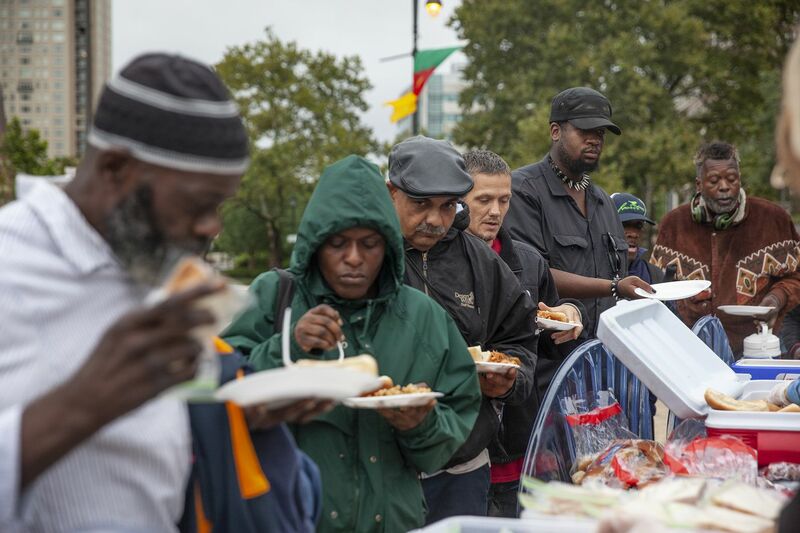 People wait in line for free food from a program called Philly Restart at 19th and the Ben Franklin Parkway on Monday afternoon, Sept. 10, 2018. The U.S. Census Bureau report released last week on Philadelphia's poverty rates was disappointing, but not surprising. Our persistent, generational poverty is the greatest challenge facing our city. Every day I am reminded that one in four of our residents lives in poverty — struggling to make ends meet, put food on the table, and keep a roof over their heads. I see it on my weekly visits to schools and summer Play Streets, where so many of our kids eat their only meals of the day. I see it at recreation centers and libraries where adults use computers to apply for jobs, and staff are forced to run outside to administer life-saving medication to someone suffering from addiction. Systemic, intergenerational poverty has been a scourge on Philadelphia for as long as I can remember. It has disproportionately impacted low and middle-income families, and specifically communities of color. >> READ MORE: Around the country, incomes are rising. In Philly, they're falling. Since day one of my administration, I have made fighting poverty a key priority. We must be mindful however, that there is no single solution, and that results of our work may take years, even decades, to fully materialize. Ultimately, I believe the best ways to make a significant reduction in poverty are to improve educational and economic opportunities, and to empower residents with the resources they need to get family-sustaining jobs. That's why we enacted the Philadelphia Beverage Tax (PBT) to provide quality pre-K to more than 5,000 children each year. Research tells us that quality early childhood education is one of the greatest investments our society can make. Children who participate in quality pre-K are more likely to graduate from high school, pursue postsecondary education, and earn more money during their lifetimes. Additionally, PHLpreK has already helped 80 pre-K providers grow — most of whom are small, minority-owned businesses. PHLpreK has created more than 250 jobs and the average hourly wage of new hires is $14.72. PBT also allows us to create 20 community schools that bring critical support services, such as food pantries, after-school programs, adult education classes, and job training to students and adults. We're also investing hundreds of millions of dollars in our neighborhoods by restoring recreation centers, playgrounds, parks, and libraries, which are lifelines for community members looking for help, or even a safe space to spend time. We have returned our schools to local control so that every Philadelphian has quality schools in their neighborhood. We've dedicated over half a billion dollars in new City revenue to the School District over the next five years. This will allow us to expand early literacy and college and career readiness initiatives, and to accelerate renovations of our aging school buildings to ensure the safety of students and school staff. We also understand that Philadelphia's adults contend with unemployment and underemployment, which is why we launched a workforce development strategy called "Fueling Philadelphia's Talent Engine" to aid both job growth and job-readiness. It will prepare Philadelphians with the skills employers need for a world-class workforce, address the barriers that prevent Philadelphians from accessing meaningful career opportunities, and build a workforce system that is more coordinated, innovative, and effective. We're also connecting residents to available benefits, a lifeline for people in need. Since 2016, our BenePhilly Centers helped more than 20,000 neighbors apply for public benefits, securing almost $20 million in previously unclaimed public assistance. I also formed an Eviction Task Force that identified ways we can stem the tide of evictions that one in 14 tenants face. So far, 600 families have moved into new, City-supported affordable homes and more than 300 more homes are under construction. We're preserving more than 300 homes that were at risk of losing affordability, and we're making improvements and repairs to the homes of 6,000 low-income residents. Just last week, we committed to provide at least $53 million in new resources to support the City's first Housing Action Plan — the largest investment in affordable housing the City has seen in years. Finding solutions to the issue of intergenerational poverty has always been, and will continue to be, a priority for me and my entire administration. All of us — government, businesses, nonprofits, philanthropy, and residents — must continue to work together to solve this vexing problem.